step up from Sunday attendance to Sunday School commitment. kids, step up to an older Sunday School. Rally Day is a party with purpose for all ages. The party is to get people plugged into community, and encourage adults and children to commit to a Sunday School Class for the Fall. So we’re going to play with our food as we get connected to Sunday School Classes this Fall. Sunday School is our version of small groups, and one of the primary tools God uses to shape us into disciples. Sunday worship and sermons are great tools for growth, but it takes intimacy, discussion, and accountability to grow significantly. If you attend on Sundays and at large group events, but are not plugged into a Sunday School class, this is the day to come act a fool, hear about classes, and get connected to a small group. Let's have fun while we get connected. 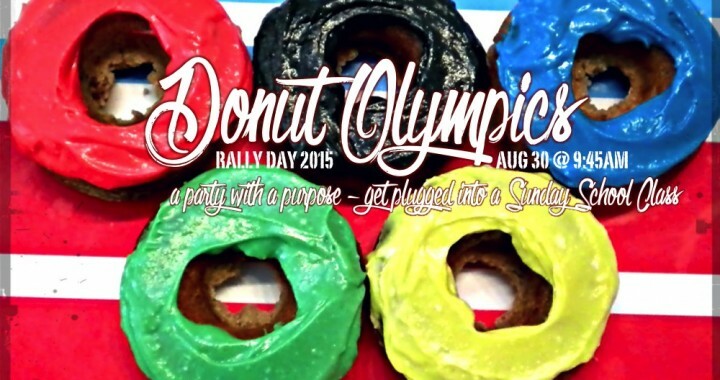 The 2015 Donut Olympics will feature games for all ages including such legendary, ancient Greek games like Donut Stacking, Donut Sculpting, Donut Hole-In-One, and Donut Roller Derby, just to name a few. Posted in Events and tagged Donuts, Get Connected, Get Plugged in, Growth is not an Option, Small Groups, Sunday School.